This article is about the local government district. For the settlement, see Wakefield. In 2010, Wakefield was named as the UK's third most musical city by PRS for Music. In recent years, the economic and physical condition of several of the former mining towns and villages in Wakefield District have started to improve due to the booming economy of Leeds – and an increase in numbers of commuters to the city from the sub-region – and a recognition of undeveloped assets. For instance Castleford, to the North East of Wakefield is seeing extensive development and investment because of the natural asset of its outlook on to the River Aire, its easy access to the national motorway network and the availability of former mining land for house-building. In Ossett, house prices have risen from an average of £50,000 in 1998 to £130,000 in 2003. The district is mainly made out of old coal-mining towns, although other industries include wool, chemicals, machine tools, glass and other forms of manufacturing. Horbury is something of an anomaly in having had an iron works. When Margaret Thatcher came to power in 1979 there were 21 pits in the district. By the time the 1984 Strike began this had decreased to 15, however it still had more collieries than any other district in the country. At the time of privatisation in November 1994, only two remained: the Prince of Wales at Pontefract, which closed in 2002, and Kellingley at Knottingley which closed in 2015 ending the industry that once dominated the district. Most of the district's pits had been very hardline during the 1984 strike. The former Borough of Wakefield was raised to city status by letters patent in 1888. It became a county borough in 1913, taking it out of the jurisdiction of the West Riding County Council. The present boundaries were set in 1974 by the Local Government Act 1972, when the county borough of Wakefield merged with the West Riding municipal boroughs of Castleford, Ossett and Pontefract, the urban districts of Featherstone, Hemsworth, Horbury, Knottingley, Normanton and Stanley, along with Wakefield Rural District and parts of Hemsworth Rural District and Osgoldcross Rural District. The new metropolitan district's city status was reconfirmed by letters patent in 1974. The Council's headquarters is County Hall, originally built for the West Riding County Council and acquired by Wakefield in 1989. The district is within a green belt region that extends into the wider surrounding counties, and is in place to reduce urban sprawl, prevent the cities and towns in the West Yorkshire Urban Area conurbation from further convergence, protect the identity of outlying communities, encourage brownfield reuse, and preserve nearby countryside. This is achieved by restricting inappropriate development within the designated areas, and imposing stricter conditions on permitted building. The green belt surrounds the Wakefield built up area, and stretches into the wider borough, with larger outlying towns and villages such as Hollingthorpe, Walton, Netherton, Castleford, Knottingley, and Pontefract exempted from it. However, smaller villages, hamlets and rural areas such as Warmfield and Heath, Stanley Ferry, Newmillerdam, Snydale, Wintersett, and Chapelthorpe are 'washed over' by the designation. The green belt was first adopted in 1987, and the size in the borough in 2017 amounted to some 23,500 hectares (235 km2; 91 sq mi). A subsidiary aim of the green belt is to encourage recreation and leisure interests, with rural landscape features, greenfield areas and facilities including the River Calder and valleys, the Aire and Calder navigation canal, Barnsley Canal, Walton nature reserve, Brandy Carr hill, Pugney's country park and lakes, Sandal Castle, Crigglestone Cemetery War Memorial, Crigglestone rugby club, Altofts and Stanley sports centres, several golf courses, Church of St Peter the Apostle at Kirkthorpe, Fitzwilliam Country Park, and the Stanley Ferry marina. The district is divided into 21 wards, with each ward represented on the district's Wakefield Metropolitan District Council by three councillors. Each councillor is elected on a first past the post basis, normally for a four-year period which is staggered annually with the other councillors of that ward so that only one councillor per ward is up for election at any one time. Exceptions to this include by-elections and ward boundary changes. The city was the safest Labour council in England in 2003, but there was a short-lived swing against Labour in recent years. After the 2008 election results the Labour Party had a majority of just one. However the death of Labour councillor Graham Phelps meant that the authority was for a time in no overall control. Labour did however, hold the seat in the by-election in January 2010 restoring their majority. In the May 2010 local elections Labour held all of their seats and made a net gain of one seat from the Independents increasing Labour's majority on the Council to three. Following the defection of an Independent to Labour, Labour's majority was increased to 5. In January 2011 a Conservative Councillor defected to become an independent Councillor, leaving the Tories with 23 seats. 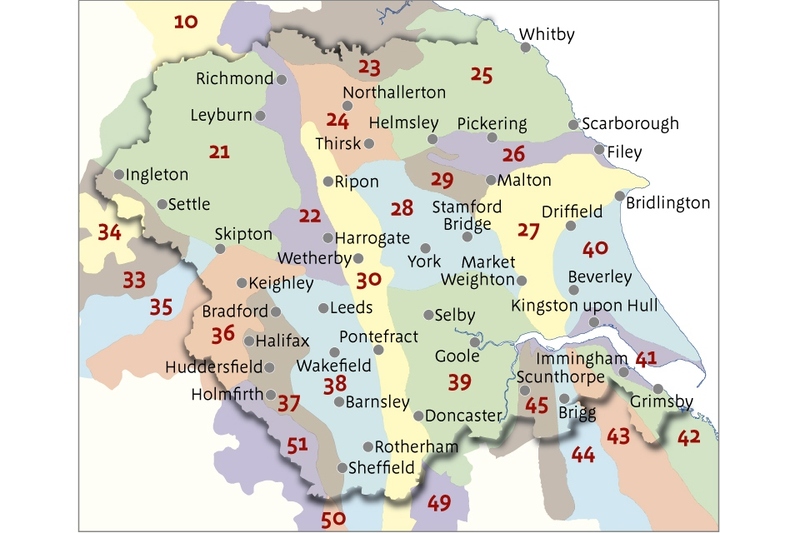 In May 2011 Labour increased their majority on the council to 15 making 5 gains, taking 3 seats from the Conservatives (Horbury and South Ossett, Pontefract South and Wrenthorpe and Outwood West), and 2 from the Independents (Featherstone and South Elmsall and South Kirkby). The Conservatives gained Ossett from the Liberal Democrats, which means there are no Liberal Democrat councillors in Wakefield. The current Council make up is Labour 54, Conservatives 6, UKIP 2 and 1 Independent following the 2014 local elections held in May 2014. The city district is home to three professional rugby league clubs, the Wakefield Trinity Wildcats, Castleford Tigers who both play in the Super League and Featherstone Rovers who play in the Kingstone Press Championship. All three have had periods of success. The city also has several amateur rugby league clubs including Featherstone Lions and Normanton Knights. Current England rugby league internationals from the area include; Tom Briscoe, Rob Burrow, Zak Hardaker, and Brett Ferres. Wakefield is also home to Frickley Athletic association football club who play in Northern Premier League Premier Division, the highest level football club in the Wakefield region, based in South Elmsall. The district has a strong heritage of cricket with former Yorkshire and England captain Geoffrey Boycott born in Fitzwilliam and current Yorkshire and England cricketer Tim Bresnan from Pontefract. A decision was made, in 2004, to transfer the district's extensive council housing to Wakefield and District Housing (WDH), an 'independent' housing association, who would be more efficient with repairs and maintaining decent accommodation; as council housing represented almost 30% of the district, this was the second-largest stock transfer in British history. WDH are investing over £700 million to regenerate the District and working with partners, such as WMDC, are investing in new housing within the District. ^ "City of Wakefield population 2011". Neighbourhood Statistics. Office for National Statistics. Retrieved 1 March 2016. ^ Richard Smith. "Bristol named Britain's most musical city". ^ "Horbury Junction Iron Co". Grace's Guide. Retrieved 31 December 2014. ^ a b c "Green belt review - Wakefield Council" (PDF). ^ "Wards". Wakefield Council. Archived from the original on 16 January 2005. Retrieved 16 December 2009. ^ "District Council Election Results 2011". Archived from the original on 2 April 2012. Retrieved 5 May 2012. ^ "Local Election Results 2014". Archived from the original on 5 December 2014. Retrieved 28 November 2014. ^ "Airedale and Ferry Fryston by-election result". ^ "Local election results 2010". Wakefield Council. Archived from the original on 9 May 2011. Retrieved 9 March 2011. ^ "Jesty, Graham". Wakefield Council. Archived from the original on 20 March 2012. Retrieved 9 March 2011.